Award-winning shell artist Lois Kessler of Guilford will be participating in the Unique Boutique Artisans Craft Fair to be held in Newport, Rhode Island on Saturday and Sunday, Nov. 10 and 11 from 10 a.m.-4 p.m. at the Rotunda Ballroom at Easton’s Beach. Unique Boutique presents only professional crafters who offer top quality, designed and handmade crafts—one-of-a-kind items such as Kessler’s sailor’s valentines: octagonal, wood, shadow box frames decorated with a wide variety of small seashells to form beautiful mosaic designs. Sailor’s valentines created today are carrying on an artistic tradition which started in the mid-1800s on the island of Barbados, a central port for sailors. 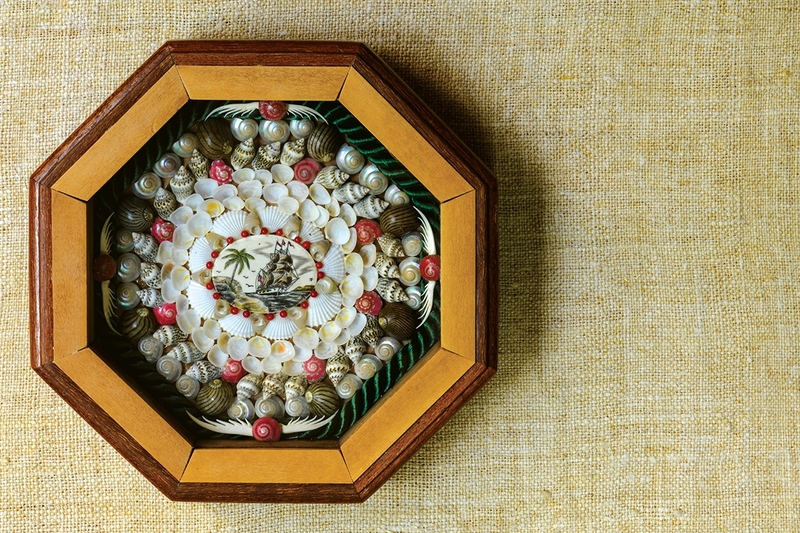 While New England lore holds that homesick sailors — out at sea for months or years — made these valentines for their sweethearts, historians suggest Barbadian women and children made the shell art pieces and the sailors bought them as sentimental gifts. Many were given to loved ones at home and the designs frequently included hearts and warm messages. Replicating a compass, the eight-sided cases enclosed in glass were hinged with a locking devise to keep them closed for safe travel back home. Original sailor’s valentines are rare and expensive, with some worth up to $40,000. They are found in private collections and museums in Britain and the United States. Her “Hearts and Flowers” sailor’s valentine was chosen for inclusion in The Directory of Traditional American Crafts and “Menuncatuck” is part of the permanent collection of The Henry Whitfield House State Museum in Guilford, Connecticut. Her work, including pocket watches and paperweights, is also available at The AquaNaut Gallery in Vineyard Haven, Martha’s Vineyard. Ranging in price from $400 to $1,400, depending on the intricacy of the design, types of shells and other pieces used such as antique ivory (scrimshaw), Kessler’s sailor’s valentines take about 35 to 45 hours to make. The boxes were made by Clifton Cloud and the late Bill Jordan, an award-winning artist both in shell art and in making perfect, octagonal, wood boxes. Kessler enjoys speaking at libraries, museums and art galleries. Visit her website, lckshelltreasures.com or her Etsy shop, LCKSeaShellTreasures, at Etsy.com to learn more. Kessler displays "Treasures from the Sea".